When revising your electrical system you should consider the addition of an AC power management system. These provide protection from miswired pedestals, high and low voltage conditions and surge suppression. They have a remote display that shows you line loading (so you can figure out exactly how much AC you are drawing on each leg of your box). 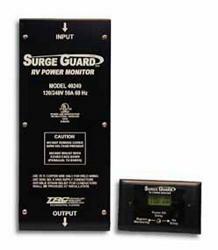 It is best to use models that are hardwired, instead of external surge guards. Hardwired models are theftproof, and you won't forget to put them out. The time you forget to plug it in will be the time you really need it. They are available in 30-amp and 50-amp versions. The Progressive Industries model 40240 (50-amp model, $494) is available at Camping World and other outlets. I highly recommend this capability – not only do you know what is going on with your AC loads, but you are protecting your coach AC system. From a design perspective, I prefer placing the 40240 directly “next to” the loadcenter if you are using a subpanel. If wiring the inverter in-line then place the management system before the inverter. This will offer protection to the inverter from surges and spikes.